Goninan plate on wagon wheel, taken by Brenda Sullivan for the Black gold, rivers of steel exhibition held in Cultural Collections during October-November 2010. Andrews, Brian R. Coal, Railways and Mines: The colliery railways of the Newcastle District and the early coal shipping facilities (Volume 1). Redfern, NSW. Iron Horse Press, 2009. Print. A Goninan and Co, started by Alfred and Ralph Goninan in 1899, made pitheads, trucks and wagons for the both private coal industry and government rail. 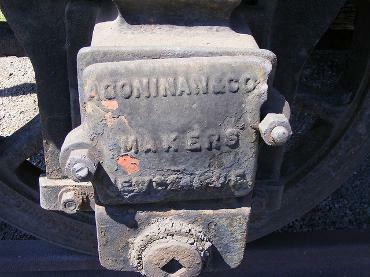 They had a subsidiary, Engineer and Colliery Supplies Co., and participated in the setting up of Commonwealth Steel for the production of railway wheels and axles. With workshops originally based in Wickham, the company moved to a newly constructed iron foundry in Broadmeadow in 1921. Locomotives were brought to this site for shunting, and proximity to rail lines made it convenient. This site was connected the the Hartley Vale Railway, constructed in 1867 by J&A Brown, as well as being close to the Waratah and Old Lambton Colliery Railways.